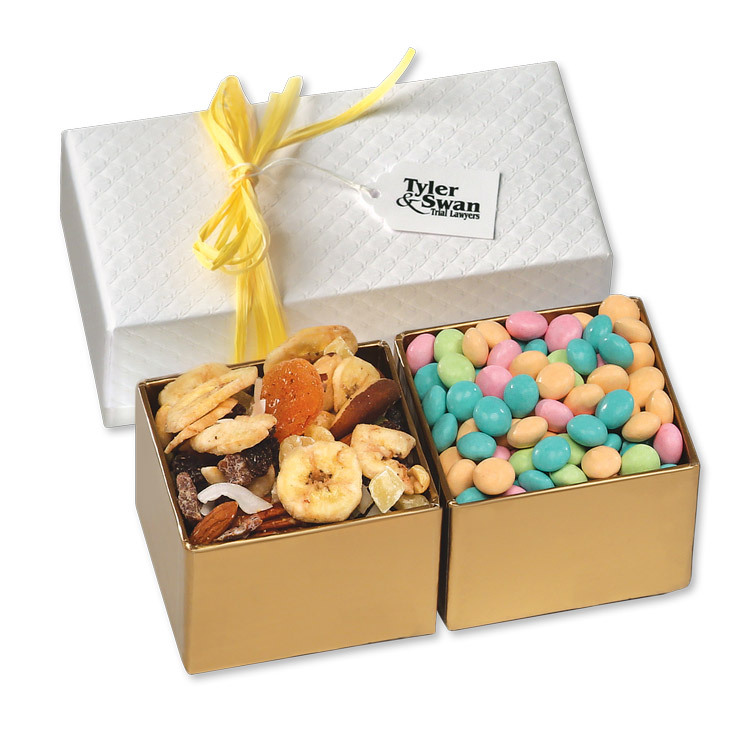 A little sweet, a little savory--there's plenty to enjoy in this white pillow top gift box, tied with bright yellow raffia. Start off with five-ounces of our Western Trail Mix, packed with perfectly-roasted nuts and sweet dried fruit, and finish it perfectly with our smooth Chocolate Gourmet Mints, six-ounces. Satisfy every craving with this delicious gift! * Sale pricing valid while supplies last. 7 3/8" x 3 7/8" x 2 1/4"
• Western Trail Mix, 5 oz. • Chocolate Gourmet Mints, 6 oz. • Price includes 4-color imprint on hang tag. • Imprint Area: 1.25" x 1"
• Maximum Size for Customer Supplied Enclosure Cards: 6" x 3 1/2"